Gluten free bakeries and specialty services have been popping up all over the bay area this past year. The more people that swear off gluten, the more that want the wheatless goodies. Good thing we don’t all have to swarm Mariposa (we still love them) or the freezer section at Whole Foods for a gluten free cookie anymore. Now there are countless places to get your carb fix, and some even deliver. Motek Treats is a brand new gluten free baking service that was launched by a young couple who have an affinity for whipping up gluten free treats made for delivery. Unique items like parmesean boule, cinnamon babka, specialty cookies and chocolate covered matzoh crackers are adored by their customers. 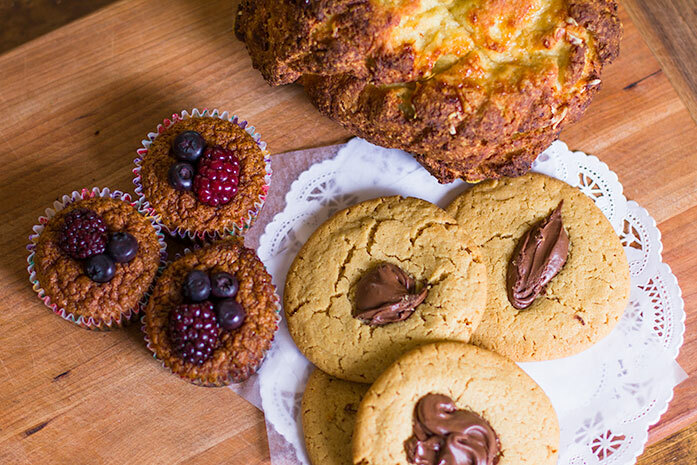 After tasting an assortment of their treats, it’s safe to say that the fresh pasta, parmesan boule and the peanut butter nutella cookies absolutely must be included in your order. Their handmade pasta boiled up in 3 minutes and had the most wonderful texture. Get your Motek treats here! We found your website and we would really like to visit your bakery, but we can’t find your adress anywhere and no telephonenumber. We are in San francisco for only two days so tankfull for quick answer. We live near Union square. Are you anywhere near? Hi Jan! I reviewed the bakery’s products but am not otherwise affiliated with them… you can get in touch with Motek treats here: http://www.motektreats.com/ they do not have a retail location. Wonderful bakery and gluten free! Red velvet was outstanding. I cannot wait to go back.